Gaza's health ministry has removed a baby from the list of Palestinians killed by Israeli forces during violent demonstrations and attempts to breach Israel's border on May 14. The death of eight-month-old Laila al-Ghandour was initially blamed on tear gas inhalation. However, a Gaza doctor told the Associated Press the baby had a pre-existing condition and her death was not a result of tear gas, which Israel used to disperse crowds of rioters. Now, the Hamas-run health ministry has taken her name off the list of people killed by Israeli soldiers as it investigates the circumstances of her death, the Guardian reports. "Laila al-Ghandour is not listed among the martyrs, because we are still waiting for the report," said Hamas health ministry spokesperson Dr. Ashraf al-Qidra. Numerous media organizations reported on the child as among those killed by the Israeli military last week, the Washington Free Beacon reported. "Palestinian baby dies from tear gas inhalation at Gaza border," read The Hill headline, citing Reuters. "A baby girl dies in the haze of Gaza," reported the Los Angeles Times. "Horror: Baby Killed In Israeli Crackdown" read the front page of HuffPost. "A funeral is taking place for an 8-month-old Palestinian baby who died after Israel fired tear gas into Gaza," tweeted Al Jazeera. 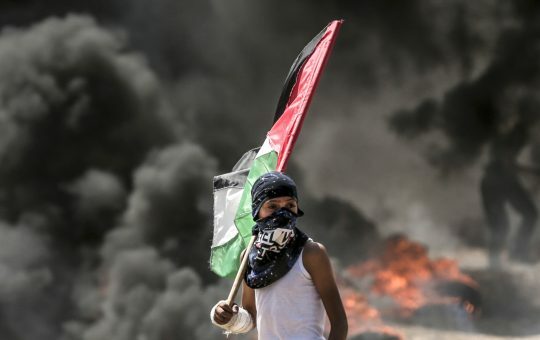 "Toll for Gaza protests rises to 61 as baby dies from tear gas, with more protests expected," reported the Washington Post. Liberal comedian Chelsea Handler also cited a "dead baby" during a series of tweets eviscerating Israel for its response to the Hamas-led riots. Nikki Haley is on tv talking about Hamas being responsible for the Palestinians protesting yesterday. These people had no weapons. They had tires to burn. There was a dead baby. While Netanyahu celebrates. A senior Hamas official said last week that 50 of the reported Palestinians killed were members of the Islamist terror organization, which controls Gaza.